This sign is original with the building constucted by Farmers' Loan and Trust Co. in 1926. It is a 22-story office building designed by the architectural firm of Starrett & Van Vleck, known for their department stores such as Lord & Taylor (1914), Saks Fifth Ave. (1924), Bloomingdale's (1930), and Abraham & Straus (Brooklyn, 1929-35). 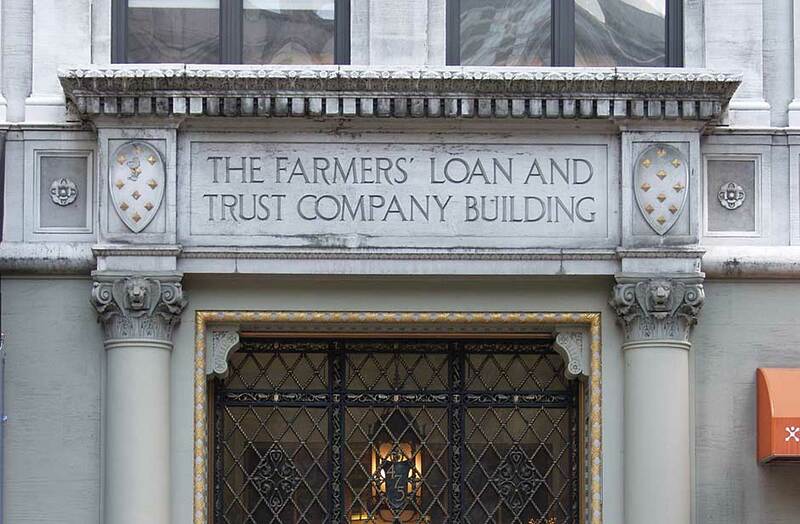 The Farmers' Loan and Trust Co. was founded as Farmers' Life Insurance & Loan Co. in 1822. The name changed to Farmers' Loan & Trust Co. in 1836. The bank was located in the Wall St. area (either on Wall St. or Exchange Place) from the 1840s until 1883. In 1883 they commissioned a new building at 20 William St. near Beaver St. (architect, Thomas Stent). This building was torn down and replaced in 1889 by a structure referred to by the addresses 16, 18, 20 and 22 William St. Click here for Farmers' ad and photo of the Farmers' Building on William Street. This appeared in Moses King's Photographic Views of New York, 1895, available on google books. In 1929 Farmers' purchased the Trust National City Bank of New York and changed their name to City Bank Farmers Trust Company. It was City Bank Farmers Trust who erected the 60-story skyscraper that now stands on the block bounded by Exchange Place, William, Beaver and Hanover streets (Cross & Cross, 1931). Click here for Farmers' ad from 1917. Click here for Farmers' ad that appeared in the Cornell Univeristy Alumni News in 1919. Both ads give the address 475 5th Ave. Farmers had a branch office at this location (from around 1906) before the present building was constructed.